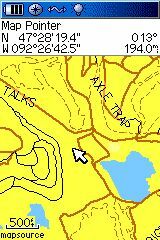 The purpose of this project is to create electronic maps of the Minnesota OHV Trails for Garmin GPS units (with mapping capability). Although the DNR provides printable maps (pdf) of the trails the addition of GPS maps allows more energy to be spent enjoying the trails and surrounding areas versus navigating. Update 9 Mar 2007: The Minnesota DNR is currently going through a re-classification of all state trails. As soon as this classifcation is complete additional trails will be added to this mapset. 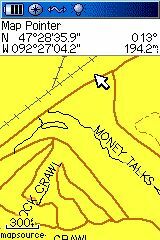 These were taken from a Garmin GPSmap 76CS. Note that the core roads are the bold, red lines, the Jeep trails are the thin black lines and the ATV/OHM trails are the dashed lines. The installation of the maps is fairly simple. The maps can utilized from within Garmin's MapSource product (if available) or simply uploaded to your GPS unit. Download and execute the installation package. A README file with more detailed usage information will be displayed upon completion of the installation. 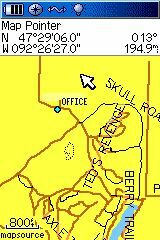 The MN OHV mapset should overlay any other mapset present on your GPS unit. If conflicts arise (between mapsets), simply hide/show mapsets as described here. - Gilbert Extras: Gilbert tracks in GPX format and a printable map of Gilbert with a Lat/Lon grid.. The information from this site (maps, etc.) are utilized to check accuracy of mapping data, obtain trail names, area names, etc. An Internet based spatial data acquisition site that allows users to download raw computer-readable data for all of Minnesota. This data can used in Geographic Information Systems (GIS), image processing systems, or traditional database environments. Several software applications are used, Manifold System is used for the initial parsing and/or querying of data (per trail type), GlobalMapper is used for the majority of data manipulation/configuration and cGPSmapper is used to compile the data into a Garmin map file.